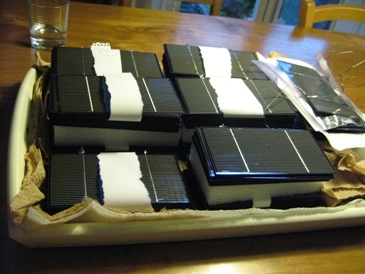 Because I think that the price of a solar panel is still pretty high(in Europe), and because the stimulation from our government (in the Netherlands) is not so good (very,very complicated and time consuming) I started the project of building my own solar panel. I would like to invite anyone who has some experience with this or is interested in it ,to give me any advice or remarks about it. The main challenge is to build a panel that can withstand heat, cold, rain and hail for many years. After some experimenting and very long brainstorming about how to continue, I found another seller on Ebay who had the same cells (of which he gave the specification that they were 1,75 Wp each……) But these were slightly damaged. Well I decided to buy 500 cells ,a mix of 3 different qualities. The seller had not counted these cells but there were 620 cells, of which after a first selection , just over 500 were reasonably good. Not a bad deal to start with. And a lot cheaper! Also now I had over 100 cells for practice on soldering and handling. Building the First Small Panel. Well I got started. Beginning with the soldering-technique, that takes some practice, but after a while you get the hang of it. And now my first small experimental panel is ready! The main focus and moreover challenge is to get the cells 100% sealed: air and water tight. The cheapest solution for me is to make a double-glass construction. And the cells in between the 2 plates of glass. The panel is made of 12 cells, each 0.55 Volts. On the picture below you can see many purple coloured wires. Those wires are each connected in between each cell so afterwards I can still do some measurements to compare each separate cell. I must say that at first I was worried whether I would see the cells really produce the power they should. But after building a variable resistance (making it possible for me to roughly find the maximum power point) the sun at last was shining (not much sunshine here beginning of February) and I got my first real measurement : 15,5 Watt. 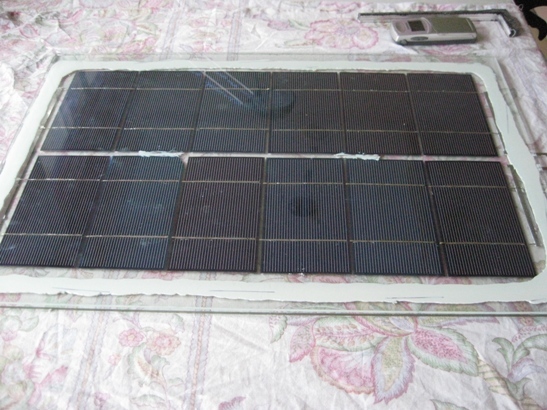 According to the specifications the panel should give a maximum of 12 x 1,75 W = 21 Wp. Given the fact that the glass takes away about 10% of the power,without the glass it would have been about 17 Watt. I expect that during summer as the sun rises much higher above the horizon, the measurement will give higher readings , thus coming closer to the specifications…. I am using normal 4 mm (0.16 inch) glass because it costs me nothing. If you just look around near places were they renovate old houses you can get the old glass for free…… This compared to the real stuff they use for solarpanels which is quite expensive and probably very difficult to find. 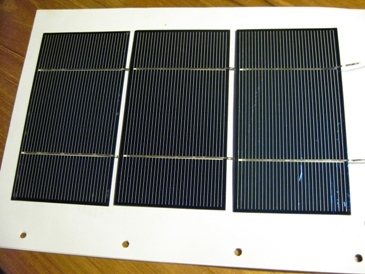 Influence of Heating the Panel in the Sun. During the first measurements, I found that the heating up of the panel was pretty strong. But this especially was the case for the backside. were the cells are glued upon (using the same kit I used for glueing and sealing the panel). This panel is 12 mm (0.47 inch) thick : 2 plates of glass each 4 mm (0.16 inch) and 4 mm in between. What troubles me is the temperature-difference between the front and backplate of glass. This will result in different expansions creating stress on the sealing,if that is repeated too often it will start leaking. Now I am using the same kit as is being used in solar panel factories. But it still worries me. 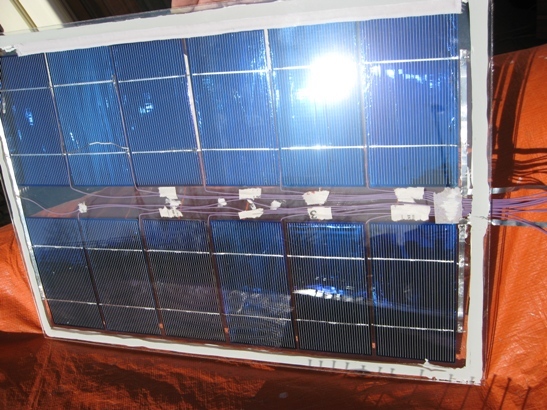 A solution can be to keep the panels small, so the difference in expansion stays minimal. Bottom line is that if the output of each cell really hits 1,75 Wp then I can come to a price of Euro 1,20 per Wp (or even lower than that….) And with such a price the panel will not have to last for 20 years……..but off course that is my aim ! That will be the main challenge ! But I must say with this second panel my hopes are getting higher. Well, who feels like building panels also ? Or give me some advice, or share experience. I do not mind getting negative critics because they might be correct………and they are there to be solved ! The first systeem of 400Wp is now fully functional and produced it’s first electricity. The cost price is now around $1.68 per Wp and is expected to drop to $1.10. More information about the next phase in the project can be read in the article DIY Built Solarpanel Installation Now Operational. And since you posted this, the prices of solar panels has decreased dramaticallly. Whether a person builds their own or buys them, the idea of free electricity has gazillions of advocates. In many place sin the world, it’s the only viable solution for electricity generation. Good post! Build DIY solar panels is not difficult things but for newbie still need some good step-by-step instruction to help them build efficient solar panels. Why not leave out the glass plate entirely? Just laminate the cells between two layers of plastic. I think it would withstand rain and some hail. Im having a hard time finding all the parts for my solar project locally. In seeing this post is several years old, the comments are no longer valid. Solar panels have come down in price so far that it is actually cheaper to buy 200+ watt panels than it is to make them from scratch. As a hobbyist however, these are very fun to build and it’s very educational for the solar enthusiests. Stumbled!